So I had spent the previous day photo shooting with the lovely Ellie Brooks for Reef which had involved not a whole lot of surfing with the swell being flat. Ellie is a fantastic surfer who travels around the globe competing on the World Surf League qualifying tour, and I really wanted to show off her surfing skills because as many surfer girls will state, they are surfers, not models! So when I got word that we would be heading to South Stradbroke Island the next day, I was excited to go. Firstly, because I had never been there and had heard the surf is amazing and secondly, because everyone talks about how beautiful a spot it is! The night before I asked Ellie what I needed to be aware of for shooting at this location to get prepped, and I felt pretty confident it was going to be an awesome day. Drive to the ferry, catch a water taxi over, shoot for the morning, water taxi home, voila! We also called up another fantastic surfer Codie Klein to join the squad. We were set! After gathering early in the morning, coffees in hand, we made the drive north and arrived to the ferry terminal, excited for an incredible day of surfing. Perhaps I should have been more concerned when I saw the confused look on the girls’ faces when we arrived and started to unpack at the ferry terminal. I could see Ellie scanning for the water taxi, but it was nowhere in sight. “Nah girls, he’s on holidays this week!” echoed a local who had just made the paddle back from the island. Our faces dropped. The Gold Coast seaway is a renowned hangout for schools of bull sharks, also known as the 'bull shark superhighway', and the paddle across is a death defying experience at the best of times. Only the week before a close friend of mine had stitches in her face from the entry to the water over the oyster encrusted rocks, let alone avoiding a pack of sharp toothed flesh chompers. “What are we going to do?” whispered Ellie hesitantly. She was in no way keen to paddle across. I looked over at Codie, and could see her concern too. “I will swim across,” I said half-jokingly, only then recalling the story from a commercial scuba diving friend who at one time saw numerous bull sharks tracking the surfers paddling above as he fixed a pipe in the seaway. “Let’s do it,” said Codie with a hint of falsified confidence. What the heck. Seriously? Ok. Crap. Water housing in hand, two surfboards, three humans, we trekked up the groyne of the seaway. And yes, it was a trek. When your head is saying, “What the hell are we doing!!! !” and your heart is pumping so fast that you think it’s going to explode onto the other side of the seaway, I could feel myself start to raise some logical concerns. Quick, snapchat that I love my mum and dad and sister and friends and OMG. What are we doing!!!! Nah. This is completely messed up, but it’s going to be ok. I calmed down. 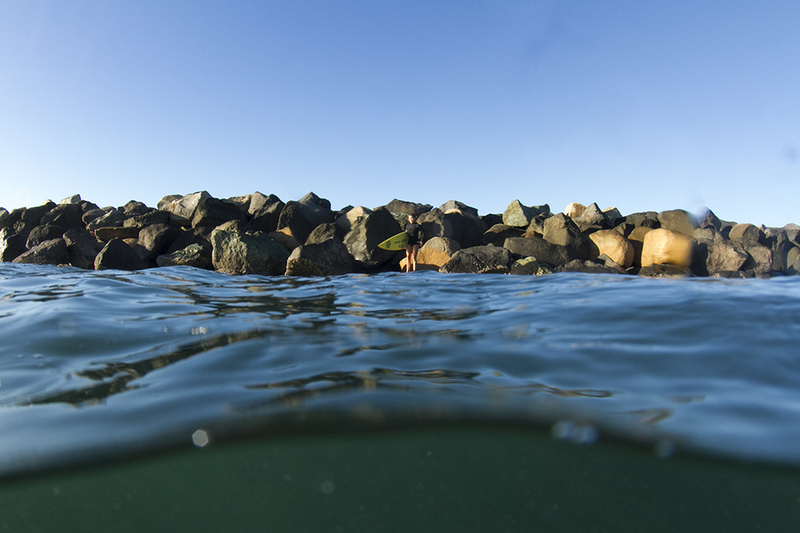 We lowered ourselves down the groyne, and jumped into the Gold Coast seaway. We started vigorously. I put my housing on Codie’s back, grabbed the side of the board and started swimming. The current was reasonable that morning, and swept us down the seaway. I couldn’t help myself half way across. The girls were looking forward. I put my head down into the water and opened my eyes. It was black. I raised my head back up faster than I could kick. I didn’t say anything. I just kept swimming. Faster. We passed a fishing boat. The crew looked at us perplexed. Three ladies of leisure enjoying a day out on the water, swimming across the seaway. LOL. And then we were there. After the most intense ten minutes, we scaled up the groyne on the other side and were in paradise. Welcome to South Stradbroke Island.